Frittatas are a favorite breakfast at Linderhof. Whether it is just Husband Jim and I or a crowd of family and friends in the dining room. Eggs at breakfast are tricky. Fried eggs are done a couple at a time which finds me spending most of breakfast time at the stove. The same goes for omelets especially if you offer different fillings. But a frittata is mixed, poured into a pan (in this case a 9 x 13) and baked. Everyone's eggs are done at the same time and you can add fillings and cheese to please your guests. And you don't have to worry about someone's eggs being too runny or someone's eggs being too hard. In summer, we come home from the Saturday's Farmer's Market and with our haul make a small frittata just for the two of us filled with the bounty of vegetables that we brought home. 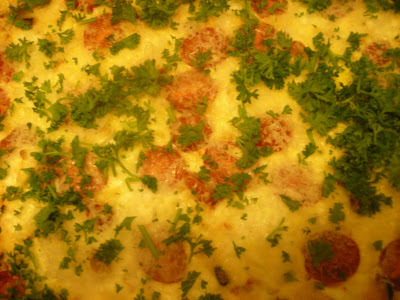 With Easter coming up, often with overnight guests, a frittata makes a great breakfast option. It's sort of like a breakfast casserole without the bread! With a big bowl of fresh fruit, perhaps some good bacon or chicken sausages and pots and pots of freshly brewed coffee, it is a good breakfast. This one is loosely based on a Barefoot Contessa recipe. I added fillings to please me and my guests. Vegetables I happened to have in the crisper. 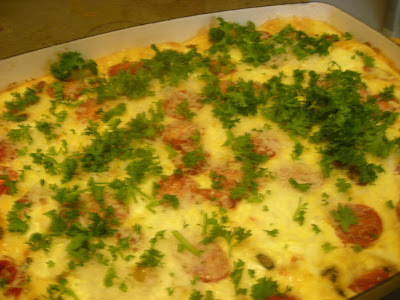 I am attaching the recipe that this frittata was based on but with my revisions added. Heat oven to 350. Melt 3 T. butter in a 10 inch ovenproof omelet pan over medium low heat. Add the potatoes and fry them until cooked through, turning often, about 10 to 15 minutes. Melt remaining 5 T. butter in a small dish in the microwave. Meanwhile, whisk the eggs, then stir in the ricotta, Guyere, melted butter, salt, pepper and basil. Sprinkle the flour and baking powder and stir into the egg mixture. Pour the egg mixture over the potatoes and place the pan in the center of the oven. 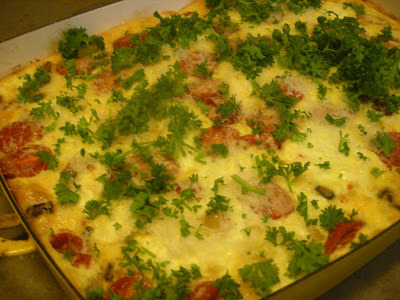 Bake the frittata until it is browned and puffed, 50 to 60 min. It will be round and firm in the middle and knife inserted in the center should come out clean. I made mine in a 9 x 13 pan and increased eggs to 12. I used cheddar cheese instead of the Gruyere and omitted the basil because it's hard to find fresh basil on the prairie in early spring. I also added cherry tomatoes to the frittata mixture and added some chopped onion when I fried the potatoes. I sprinkled parsley over it before serving. When I served the frittata, I served freshly baked blueberry muffins alongside. With orange juice and freshly brewed coffee, the frittata got rave reviews! Yum! Put the coffee on, I'm coming over for breakfast! Your fritata looks fabulous. I have not made this recipe before and particularly like the addition of ricotta cheese. Will make this soon. We like fritata's for a light dinner on occassion. The mention of the basil in the recipe reminds me that I need to get my basil planted. Thanks. This is something I've never tried - but it will star on Saturday's brunch. I love the idea of not standing at the stove cooking eggs at the last minute.